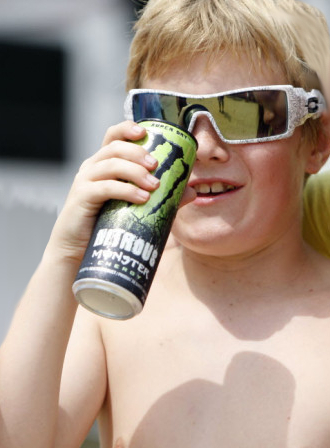 Experts want to ban the sale of caffeinated energy drinks to children and young people. Children and young people in high income countries consume more sugar and calories than required and are considered unlikely to need additional energy. This combined with regular caffeine consumption is concerning, as there is little evidence of the effect caffeine could potentially have on the developing body, according to Professor Russell Viner, President of the Royal College of Paediatrics and Child Health in the UK. Recent surveys of British kids have found up to 14 per cent of 11-15 year olds reported consuming energy drinks at least two to four times a week, and 5 per cent of all young people reported drinking energy drinks daily. The high sugar content in many of these drinks (as much as 27g of sugar per 250ml serving) “undoubtedly contributes to the overall calorie excess and resultant obesity epidemic among our children,” Dr Viner says. Caffeine is probably the most commonly used psychoactive drug across the world as it increases activity and heightens attention and awareness. But caffeine also increases anxiety, reduces sleep and is linked with behavioural problems in children, adds Viner. Recent studies also show that it may have concerning effects on the developing brain. Yet surprisingly little is known about the safety profile of caffeine. Energy drinks can contain at least 320 mg/L of caffeine and evidence is emerging that consumption of energy drinks among children and young people is associated with anxiety, depression, sensation seeking, and increased hyperactivity and inattention. This is alarming, says Viner, because psychological distress can lead to risky behaviours like drug use, and poorer academic attainment. But perhaps most concerning are the effects on sleep, he says - a clear inverse association has been established between consumption of caffeinated energy drinks and sleep duration. Humans get energy naturally from a “good diet, refreshing sleep, exercise and, most importantly, interaction with other people”, he writes. Dr Viner’s full argument is spelled out in a new article for the BMJ.